Product Activation is a set of tools for viewing product license information and activating products. There are two tools: Licensing and Support. The Licensing tool enables you to view the detailed license information, activate or de-activate an Appeon Server, and update the license. After you purchase the product, you will need to activate Appeon Server for permanent use. See the following flowchart for the activation process. Step 1: Generate the activation request (the Appeon BIN activation file). On the Licensing page, click the Activate button. From the Product Key Type dropdown list box, select the product type that you have purchased. The difference between Appeon Web & Appeon Mobile and Appeon Universal is mainly the way of allocating the sessions/devices. For Appeon Universal, Web apps and mobile apps can share the unused sessions/devices; while for Appeon Web & Appeon Mobile, the Web apps and the mobile apps are strictly limited by their own session counts. For example, if the Web session is set to 5, and the Mobile session is set to 10, then for Appeon Web & Appeon Mobile, the Web sessions cannot exceed 5 and the Mobile sessions cannot exceed 10, while for Appeon Universal, so long as the total sessions do not exceed 15, the Web session can go over 5 if there are unused Mobile sessions, or the Mobile sessions can go over 10 if there are unused Web sessions. From the Control Type dropdown list box, select a control type. Application: it controls how many applications on this Appeon Server can be accessed at a particular time. Session/Device: it controls how many sessions and/or devices can access the apps on this Appeon Server at a particular time. For Web applications, each application instance running on the client is considered as one session, for mobile applications, each mobile device that is accessing the app (no matter how many apps) is considered as one device. The Appeon Mobile app will need to get the device ID when running on the mobile device, so that the app as well as other Appeon Mobile apps running on the same mobile device can be recognized as running on one device by the Appeon license file, not running on multiple devices. App ID Prefix: you should always input the same App ID Prefix for all Appeon Mobile apps. You can specify the App ID Prefix when packaging the mobile project in the Appeon Developer Package tool in Appeon Developer User Guide. App ID Suffix (Bundle ID): Bundle ID is used to identify the application, therefore it must be unique for different applications. You can specify the Bundle ID when packaging the mobile project in the Appeon Developer Package tool in Appeon Developer User Guide. You should specify the consistent Bundle ID in the Xcode project for the same application. For details, refer to the section called “Task 3.1: Set App ID and Bundle Identifier” in Appeon Mobile Tutorials (Mobile only). In the product key field(s), double check the product key and modify it if it is incorrect. (Optional) Check the Is Virtual Machine checkbox, if the server is running on a virtual machine rather than a physical machine. (Optional) Check the Support Offline checkbox, if your license supports offline features. Click the Generate Activation Request button. Click the Download File button to download the request file which is by default named as license.activation.bin and send it to <license@appeon.com>. The request will be processed in Appeon and an activated permanent license (license.appeon) will be sent to you later. Step 2: Install the permanent license file. The license file must be installed within 30 days after it's generated. If this 30-day install period has expired, the license file cannot be installed, and there will be an error in AEM when you try to install it. In this case, you will need to send the license file back to Appeon and have Appeon extend the install period for this file. Once you get the license file, follow the steps below to install it via AEM. After getting the permanent license (license.appeon) from Appeon, click the Apply License button. Click the Browse... button and select the license.appeon file. The file name must be exactly license.appeon, and it is case-sensitive. Click the Import button to import the license file. Please make sure the license file is imported successfully, and then restart Appeon Server. After you restart Appeon Server, go back to the Licensing page, and verify that Activation Status is shown as Activated. Back up your permanent license file so you can use it again in case you will reinstall Appeon Server within the 30-day install period. Each copy of Appeon Server can only be activated on one machine. If you want to activate an Appeon Server on a different machine, you would need to de-activate Appeon Server on the previous machine first and then activate it on the new machine, by following the instructions below. Step 1: De-activate Appeon Server on the previous machine. Click the De-Activate button in the Licensing page. You will be prompted by two sequential messages to confirm whether you want to deactivate Appeon Server on this machine. IMPORTANT: Please be cautious with this action, as it is irreversible, and once you click OK, the license file will become invalid and can no longer be installed on this machine unless it is re-generated. Click OK to continue if you are sure to de-activate this Appeon Server. Click the Download File button to download the file whose name is license.reactivation.bin by default. 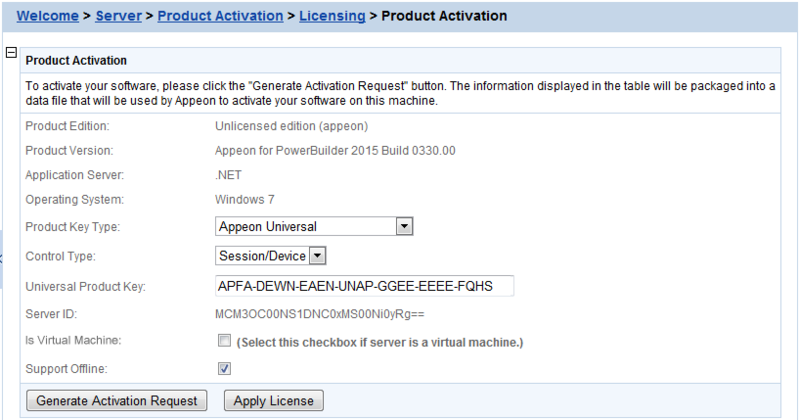 Step 2: Generate the activation request for Appeon Server on the new machine. Follow the steps in Generate the activation request to get the license.activation.bin file and save it in a safe place. Step 3: Email Appeon to generate the license file for the new server. You should send both the license.reactivation.bin file and the license.activation.bin file to <license@appeon.com> to apply a reactivated license for the new server. Step 4: Install the license on the new server. 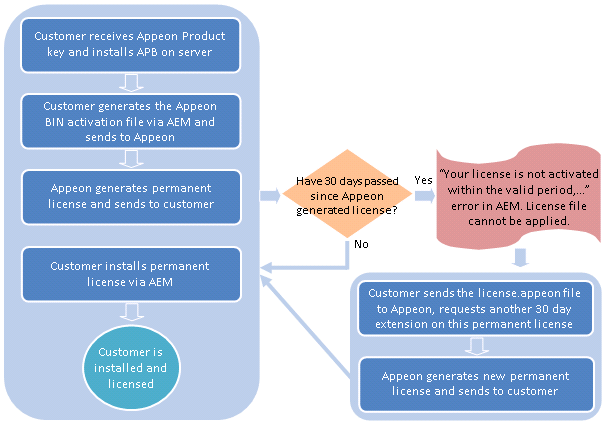 Appeon will process the reactivation request and send you a valid reactivated license file (license.appeon). You need to install this license file on the new server. For detailed instructions, please refer to Install the permanent license file. Step 1: On the Licensing page, click the Upgrade License button. Step 2: On the Upgrade License page, input the information for upgrading the license. Step 3: Click the Generate License Upgrade Application button. Step 4: Click the Download File button to download the request file which is by default named as license.update.bin and send it to <license@appeon.com>. The request will be processed in Appeon and an upgraded license will be sent to you later. 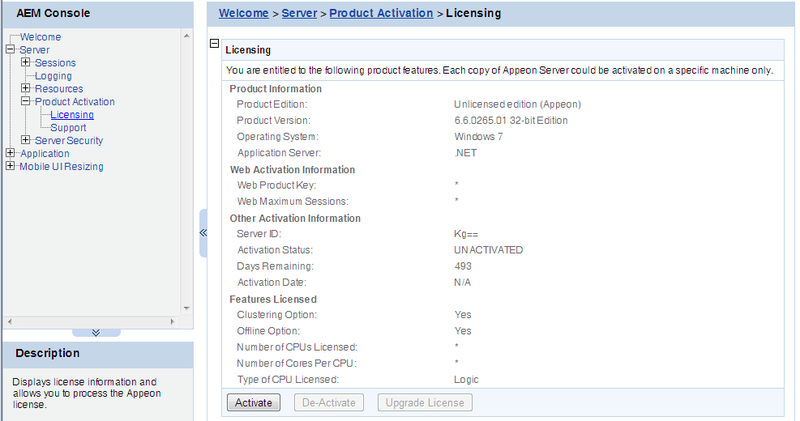 Step 5: After receiving the upgraded license from Appeon, click the Apply License button in the Upgrade License page. Step 6: Click the Browse... button and select the license.appeon file. Click the Import button to import the license file. Please make sure the license file is imported successfully, and then restart Appeon Server. Step 7: After you restart Appeon Server, go back to the Licensing page, and verify that the license information is updated, and the Activation Status is shown as Activated. The Support tool enables you to view the valid product support period, which starts from the day you place the product order and expires in 1 year later. You can renew the support before or after the license expires, and apply the renewed license to extend the support period. Renew Support and Apply License will be enabled when the product is activated. Support Expiration will not affect the normal running of Appeon. However, after the expiration you are no longer entitled to install product upgrades/EBFs or get technical support assistance from Appeon. You can renew your product support prior to the expiration date to ensure you are benefiting from the latest product enhancements, maintenance releases and the technical support assistance. Step 1 - Click the Renew Support button. In the Renew Support page, enter the time you want to extend, which should only be an integer. Click the Generate Renew Request button. Note: The order date is counted from the first date when your last license expired. Step 2 - Click the Download File button to download the request file which is by default named as license.support.bin and send it to <license@appeon.com>. The request will be processed in Appeon and a new license with extended support period will be sent to you later. 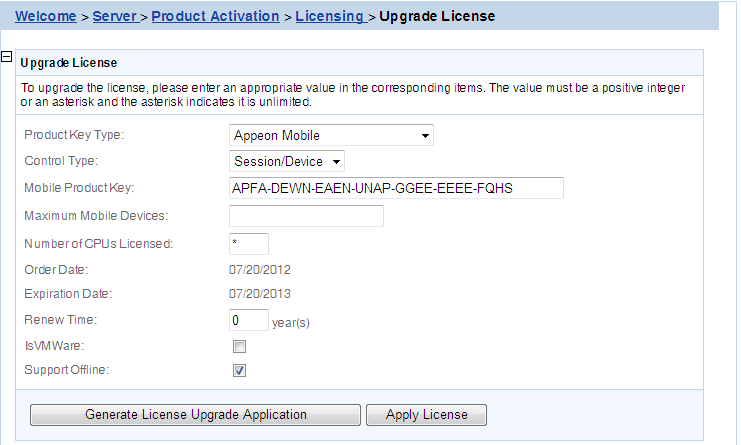 Step 3 - When you get the new license named license.appeon, click the Apply License button. 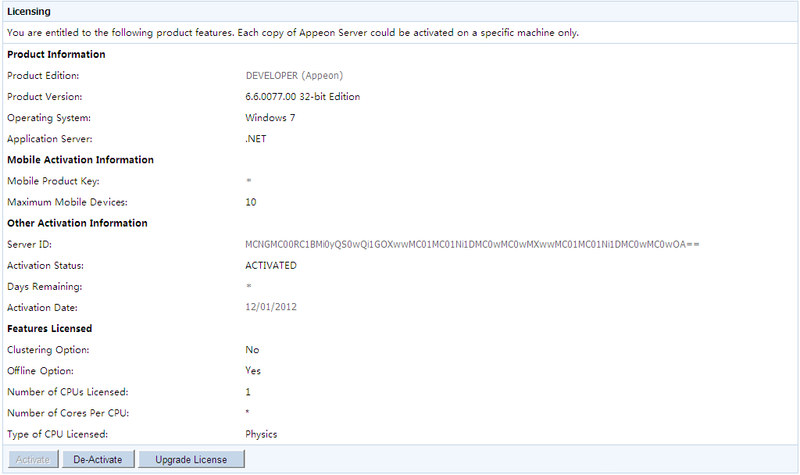 Step 4 - In the Apply License window, click the Browse... button to select the license.appeon file delivered by Appeon. Click the Import button to import your license file. Step 5 - Restart Appeon Server after importing the license file, and go back to the Support page to ensure the support is correctly extended.